Classification of Fish - Their Form and Colour - Mode and Means of Life - Curiously-shaped Fish - Senses of Smell and Hearing in Fish - Fish nearly Insensible to Pain - The Fecundity of Fish - Sexual Instinct of Fish - External Impregnation of the Ova - Ripening of a Salmon Egg - Birth of a Herring - The Rich versus the Poor Man's Fish - Curious Stories about the Growth of the Eel - All that is known about the Mackerel-Whitebait-Mysterious Fish: the Vendace and the Powan -Where are the Haddocks? - The Food of Fish - Fish as a rule not Migratory - The Growth of Fish Shoals - When Fish are good for Food - The Balancing Power of Nature. FISH form the fourth class of vertebrate animals, and, as a general rule, live in water; although in Ceylon and India species are found that live in the earth, or, at any rate, that exist in mud, not to speak of others said to occupy the trees of those countries! The classification of fishes given by Cuvier is usually adopted. He has divided these animals into those with true bones, and those having a cartilaginous structure; the former, again, being divided into acanthopterous and malcopterous fish. Other naturalists have adopted more elaborate classifications; but Cuvier’s being the simplest has a strong claim to be considered the best, and is the one generally used. A fish breathes by means of its gills, and progresses chiefly by means of its tail. This animal is admirably adapted for progressing through the water, as may be seen from its form, and fish are exceedingly beautiful, both as regards shape and colour. There are comparatively few persons, however, who have an opportunity of seeing them at the moment of their greatest brilliancy, which is just when they are brought out of the water. I allude more particularly to some of our sea fish—as the herring, mackerel, etc. The power of a fish to take on the colour of its hiding-place may be mentioned; various kinds, when in the water, as may be observed at the Brighton and Crystal Palace Aquariums, are not to be distinguished from the vegetable matter in which they take shelter. It is almost impossible to paint a fish so as accurately to transmit to canvas its exquisite shape and glowing colours, because the moment it is taken from its own element its form alters and its delicate hues fade: and in different localities fish have, like the chameleon, different hues, so that the artist must have a quick eye and a responding hand to catch the fleeting tints of the animal. Nothing, for instance, can reveal more beautiful masses of colour than the hauling in of a drift of herring-nets. As breadth after breadth emerges from the water the magnificent ensemble of the fish flashes ever-changing upon the eye—a wondrous gleaming mixture of blue and gold, silver and purple, blended into one great burning glow, and lighted to brilliant life by the soft rays of the newly-risen sun. But, alas for the painter! unless he can instantaneously fix the burnished mass on his canvas, the light of its colour will fade, and its harmonious beauty become dim, long before the boat can reach the harbour. The brightly-coloured fish of the tropics are gorgeous, as the plumage of tropical birds ; but as regards flavour and food power, they cannot for a moment be compared with that beautiful fish—the common herring, or pilchard, of our British waters. If the breathing apparatus of a fish were to become dry the animal would at once suffocate. When in the water a fish has very little weight to support, as its specific gravity is about the same as that of the element in which it lives, and the bodies of these animals are so flexible as to aid them in their movements, while the various fins assist either in balancing the body or in aiding progress. The motion of a fish is excessively rapid; it can dash through the water with lightning-like velocity. Many of our sea fish are curiously shaped, such as the hammer-headed shark, the globe-fish, the monk-fish, the angel-fish, etc. ; then we have the curious forms of the rays, the flounders, and of some other "fancy fish ;" but all kinds are admirably adapted to their mode of life and the place where they live—as, for instance, in a cave where light has never penetrated fish have been found without eyes! Fresh-water fish do not vary much in shape, most of them being very elegant. Fish are cold-blooded, and nearly insensible to pain, their blood being only two degrees warmer than the element in which they live. It is worthy of note that fish have small brains compared to the size of their bodies—considerably smaller in proportion than in the case of birds or mammalia, but the nerves communicating with the brain are as large in fish, proportionately, as in birds or mammalia. The senses of sight and hearing are thought to be well developed in fish, likewise those of smell and taste, particularly smell, which chiefly guides them in their search for food. Fish, I think, have a very keen scent; thus it is that strong-smelling baits are successful in fishing. The French people, for instance, when fishing for sprats and sardines, bait the ground with prepared cod-roe, which adds largely to the expense of that branch of fishing in the Bay of Biscay. As an evidence of fish having a strong sense of smell, salmon-roe used to be a deadly trout-bait. Some naturalists assert that fish do not hear well, which is contrary to my own experience; for after repeated trials of their sense of hearing, I found them as quick in that faculty as in seeing; and have we not all read of pet fish summoned to dinner by means of a bell, and of trouts and cod-fish that have been whistled to their food like dogs ? Water is an excellent conducter of sound: it conveys noise of any kind to a great distance, and nearly as quick as air. Benjamin Franklin often experimented on water as a conductor, and arrived at the conclusion that its powers in this way are wonderful. Most kinds of fish are voracious feeders, preying upon each other without ceremony; and the greatest difficulties of anglers are experienced after fish have had a good feed, when the practised artist, with seductive bait, cannot induce them even to nibble. Many fish have a digestion so rapid as to be comparable only to the action of fire, and on good feeding-grounds the growth of fish corresponds to their power of eating. In the sea there exists an admirable field for observing the cannibal propensities of fish, where shoals of one species have apparently no other object in life than to chase other kinds with a view to eat them. To compensate for the waste of life incidental to their place of birth and their ratio of growth, nature has endowed this class of animals with enormous reproductive power. Fish yield their eggs by thousands or millions, according to the danger incurred in the progress of their growth. There is nothing in the animal world that can in this respect be compared to them, except perhaps a queen bee, with fifty thousand young each season; or the white ant, which produces eggs at the rate of fifty per minute, and goes on laying for a period of unknown duration; not to speak of that terrible domestic bugbear which no one likes to name, but which is popularly supposed to become a great-grandfather in twenty-four hours! The little aphides of the garden may also be noted for their vast fecundity, as may likewise the common house-fly. During a year one green aphis may produce one hundred thousand millions of young; and the house-fly lays twenty millions of eggs in a season ! But although there may be thirty thousand eggs in a herring, the reader must bear in mind that if these be not vivified by the milt of the male fish, they rot in the sea, and never become of food value, except perhaps to some minor monster of the deep. Millions of the eggs that are emitted by the cod or the herring never come to life—many of them from lack of fructifying power, others being devoured by enemies. Then, again, of those eggs that are ripened, it is ascertained from careful inquiry, that fully ninety per cent of the young fish perish before they are six months old. Were only half the eggs to come to life, and but one moiety of the young fish to live, the sea would so abound with animal life that it would be impossible for a boat to move in its waters. But we can never hope to realise such a sight; and when it is considered that a single shoal of herrings consists of many millions of individual fish, and takes up a space in the sea far more than that occupied by the city of London, and yet gives no impediment to navigation, my readers will see the magnitude of our fish supplies; but, by the destruction of fish life from natural causes, the breeding stock is kept down to an amount that may not be far from the point of extermination. The figures of fish fecundity are quite reliable, and are not dependent on guessing, because different persons have taken the trouble, the writer among others, to count the eggs in the roes of some of our fish, that they might ascertain exactly their amount of breeding power. It is well known that the female salmon yields eggs at the rate of about one thousand for each pound weight, and some fresh-water fish are even more prolific; sea fish, again, far excelling these in reproductive power. The sturgeon, for instance, is wonderfully fecund, as much as two hundred pounds weight of roe having been taken from one fish, yielding a total of 7,000,000 of eggs. I possess the results of several investigations into fish fecundity, which were conducted with attention to details, and without any desire to exaggerate: these give the following results :—Cod-fish, 3,400,000; flounder, 1,250,000; sole, 1,000,000; mackerel, 500,000; herring, 35,000, and smelt, 36,000. Any person who wishes to manipulate these figures may try by way of experiment a few calculations with herring. The produce of a single herring is, say, thirty-six thousand eggs, but we may—the deduction being a most reasonable one—allow that half of these never come to life, which reduces the quantity to eighteen thousand. Allowing that the young fish are able to repeat the story of their birth in three years, we may safely calculate that the breeding stock by various accidents will be reduced to nine thousand individuals; and granting half of these to be females, or let us say, for the sake of rounding the figures, that four thousand of them yield roe, we shall find by multiplying that quantity by thirty-six thousand (the number of eggs in a female herring) that we obtain one hundred and forty-four millions as the produce in three years of a single pair of herrings; and although half of these might be taken for food as soon as they were large enough, there would still be left an immense breeding stock even after all casualties had been given effect to; so that the devastations committed on the shoals while capturing for food uses must be enormous, if, as is asserted, they affect the reproductiveness of these useful animals. Of course this is but guesswork. Practical people do not think that, taking all times and seasons into account, five per cent of the roe of our herrings come to life. It is known even to tyros in the study of natural history, as well as anglers and others interested, that the impregnation of fish-eggs is a purely external act; but at one time this was not believed, and a portion of the experiments at the Stormontfield salmon-breeding ponds was dedicated to a solution of this question, with what result may be guessed. The old theory, that it is contrary both to fact and reason that fish can differ from land animals in the matter of the fructification of their eggs, was signally defeated, and the question conclusively settled at the ponds in a very simple way—namely, by placing in the breeding-boxes a quantity of salmon eggs which not having been brought into contact with milt, rotted away. Curious ideas used to prevail on this branch of natural history. Herodotus observes of the fish of the Nile, that at the spawning season they move in vast multitudes towards the sea; the males lead the way, and emit the engendering principle in their passage; this the females absorb as they follow, and in consequence conceive, and when their ova are deposited they arc then matured into fry! Linnaeus backed up this idea, and asserted that there could be no impregnation of the eggs of any animal out of the body. It is this wonderfully exceptional principle in fish life that gave rise to pisciculture—i.e. the artificial impregnation of the eggs of fish forcibly exuded and brought into contact with the milt, independent altogether of the will or instinct of the animal. The principle which brings male and female together at the spawning period is unknown. It is supposed by some naturalists that fish do not gather in shoals till they perform the grandest action of their nature, and that till such period each animal lives a separate life. If we set down the sense of smell as the power which attracts the fish sexes, we shall be nearly correct: cold-blooded animals cannot have any more powerful instinct. A very clever Spanish writer on pisciculture hints that the fish have no amatory feeling for each other at that period, thus forming a curious exception to most other animals, and that it is the smell of the roe in the female which attracts the male. This idea—viz, as to the shoaling of fish at the period of spawning only—has been thrown out in regard to the herring by parties who do not admit even a partial migration from deep to shallow water, which, however, is an idea stoutly held by some writers on the herring. It is rather interesting, however, in connection with this phase of fish life, to note that particular shoals of herrings deposit their spawn at particular places, that the eggs come simultaneously to life, and that it is certain that the young fish remain together for a considerable period—a few months at least—after being hatched. This is well known from large bodies of young herrings being caught during the sprat season: these could not, of course, have assembled to spawn; too young, and without milt or roe. This, if these fish separate, gives rise to the question—At what period do the herrings begin their individual wanderings? Sprats, of course, may have come together, at the period when they are so largely captured, for the purpose of perpetuating their kind; but, if so, they must live long together before they acquire milt or roe. And how is it that we so often find young herrings in sprat shoals? Then, again, how comes it that fishermen do not frequently fall in with the separate herrings during the white-fishing seasons? How is it that fisher-men find particular kinds of fish always on particular ground? How is it that eels migrate in immense bodies? My opinion is, that particular kinds of fish do hold always together, or, at all events, gather at particular seasons into greater or lesser bodies. Life among the inhabitants of the sea is, doubtless, quite as diversified as life on land, where we observe that many kinds of animals colonise—ants, bees, etc. Are, therefore, the old stories about each kind of fish having a king so absolutely incredible after all? That there are schools of fish is certain; how the great bodies may be divided or governed, none can tell. It is noteworthy that fish-eggs afford us an admirable opportunity of studying a peculiarly interesting stage of animal life— namely, the embryo stage—which, naturally enough, is obscure in all animals. Having observed the eggs of salmon in all stages of progress, from the period of their first contact with the milt till the bursting of the egg and the coming forth of the tiny fish, I venture briefly to describe what I have seen, because salmon eggs are of a convenient size for continued examination. The roe of this fine fish is, I daresay, pretty familiar to most of my readers. The microscope reveals the eggs of salmon as being more oval than round, although they appear quite round to the naked eye. A yolk seems to float in the dim mass, and the skin or shell appears full of minute holes, while there is an appearance of a kind of funnel opening from the outside and apparently closed at the inner end. The milt is found to swarm with a species of very small creatures with big heads and long tails, apparently of very low organisation. On the contact of this fluid with the egg, into which it enters by the canal, an immediate change takes place—the ovum becomes illuminated by some curious power, and the egg appears a great deal brighter and clearer than before. It is surely wonderful that, by the mere touching of the egg with this wonder-working sperm, so great a change should take place—a change indicating that the grand process of reproduction characteristic of all living nature has begun, and will go on with increasing strength to maturity. brilliancy till certain threads of blood faintly prefigure the young fish. After another day or two the bright spot assumes a ring-like form, having a clear space in the centre, and the blood-threads then become more and more apparent. These blood-like tracings are ultimately seen to take an animal shape; but it would be difficult at first to say what the animal may turn out to be—whether a tadpole or a salmon. After this stage of development is reached, two bright black specks are seen— these are the eyes of the fish. We can now, from day to day, note the animal gradually assuming a more perfect shape; we can see it change palpably almost from hour to hour. After the egg has been laved by the water for a hundred days, we can observe that the young fish is then thoroughly alive, and, to use a common expression, kicking. We can see it moving, and can study its anatomy, which, although as yet very rudimentary, contains all the elements of the perfect fish. Heat expedites the birth of the animal. The eggs of a minnow have been sensibly advanced towards maturity by being held on the palm of the hand. Salmon eggs deposited early in the season, when the temperature is high, come sooner to life than those spawned in mid-winter: indeed a difference of as much as fifty days has been noticed between those deposited in September and those spawned in December, the one requiring ninety, the other one hundred and forty days to ripen into life. Salmon have been brought to life in sixty days at Huningue; but the quickest hatching ever accomplished at the Stormontfield breeding-ponds was when the fish came to life in one hundred and twenty days. The preceding drawing shows the eggs at about their natural size, as also the growth of the fish in its early stages. and five months, according to the openness or severity of the season. When at last the infant animal bursts from its fragile prison, it is a clumsy, unbalanced, tiny thing, having attached to it the remains of the parental egg, which hamper its movements; but, after all, the remains of its little prison are exceedingly useful, as for about thirty days the young salmon cannot obtain other nourishment than what is afforded by this umbilical bag. We have never yet been able to obtain a sight of the ripening eggs of any of our sea fish at a time when they would prove useful to us. No one, so far as I know, has seen the young herring burst from its shell under such advantageous circumstances as we can view the salmon ova; but I have seen bottled-up spawn of that fish just after it had ripened into life, the infant animal being remarkably like a fragment of cotton thread that had fallen into the water: it moved about with great agility, but required the aid of a microscope to make out that it was a thing endowed with life. Who could suppose, while examining those wavy floating threads, that in a few months afterwards they would be grown into beautiful fish, with a mechanism of bones to bind their flesh together, scales to protect their body, and fins to guide them in the water But young herring cannot be long bottled up for observation, or be kept in an artificial atmosphere; for in that condition they die almost before there is time to see them live; and when in the sea there are no means of tracing them, because they are speedily lost in an immensity of water. Perhaps now that we have large aquariums at Brighton and the Crystal Palace, we shall be able to trace the progress of the fish with more exactitude. There are points of contrast between the salmon and the herring which are worthy of notice. They form the St. Giles’ and St. James’ of the fish world, the one being a portion of the rich man’s food, the other filling the poor man’s dish. The salmon is hedged round by protecting Acts of Parliament, but the herring gets leave to grow just as it swims, parliamentary statutes not being thought necessary for its protection. The salmon is born in a fine nursery, and wakened into life by the music of beautiful streams : nurses and night-watchers, hover adout its cradle and guide its infant ways ; the herring, however, like the brat of some wandering pauper, is dropped in the great ocean workhouse, and cradled amid the hoarse roar of ravening waters, whether it lives or dies being a matter of no moment, and no person’s business. Herring mortality in its infantile stages is appalling, and even in its old age, at a time when the rich man’s fish is protected from the greed of its enemies, the herring is doomed to suffer the most. And then, to finish up with the same appropriateness as they have lived, the venison of the waters is daintily laid out on a slab of marble, while the vulgar but beautiful herring is handled by a dirty costermonger, who drags it about in a filthy cart drawn by a wretched donkey. At the hour of reproduction the salmon is guarded with jealous care from the hand of man, but at the same season the herring is offered up a wholesale sacrifice to the destroyer. It is only at its period of spawning that the herring is fished. How comes it to pass that what is a high crime and misdemeanour in the one instance is a government-rewarded merit in the other ? To kill a gravid salmon is as nearly as possible felony ; but to kill a herring as it rests on the spawning-bed is an act at once meritorious and profitable! 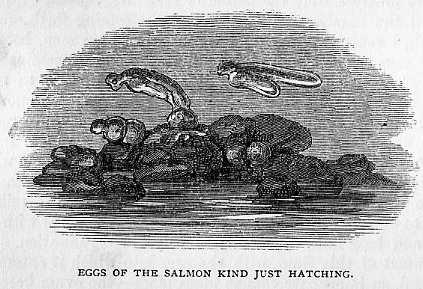 Having given my readers a general idea of the fecundity of fish, and the method of fructifying the eggs, and of the development of these into fish—for, of course, the process will be nearly the same with all kinds of fish eggs, the only difference perhaps being that the eggs of some varieties will take a longer time to hatch than those of others—I will now consider the question of fish growth. All fish are not oviparous. There is a well-known blenny which is viviparous, the young of which at the time of their birth are so perfect as to be able to swim about with great ease; and this fish is also very productive. Our skate fishes are all viviparous. "The young are enclosed in a horny capsule of an oblong square shape, with a filament at each corner. It is nourished by means of an umbilical bag till the due period of exclusion arrives, when it enters upon an independent existence." I could name a few other fish which are viviparous. In the fish-room of the British Museum may be seen one of these. It is known as Ditrenia argentea, and is plentifully found in South America. But information on this portion of the natural history of fish is still very obscure. Many facts of fish biography have yet to be ascertained, which, if we knew, would probably conduce to stricter economy of fish life and better regulation of the fisheries. Beyond a knowledge of generalities, the kingdom of the sea is a sealed book. No person can tell, for example, how long a time elapses from the birth of any particular fish till it is brought to table. Sea fish grow up unheeded—quite, in a sense, out of the bounds of observation. Naturalists can only guess at what rate a cod-fish grows. The life of a herring, in its most important phase, is still a mystery; and at what age mackerel or other fish becomes reproductive, who can say? The salmon is the one fish that has hitherto been compelled to render up to those inquiring the secret of its birth and the ratio of its growth. We have imprisoned this valuable fish in artificial ponds, and by robbing it of its eggs have noted when the young ones were born and how they grew, why then not devise a means of observing sea fish at the expense of the nation? What naturalists chiefly and greatly need in respect of sea fish is, precise information as to their rate of growth. We have a personal knowledge of the fact of sea fish selecting our shores as a spawning-ground, but we do not precisely know in some instances the exact time of spawning, how long the spawn takes to quicken into life, or at what rate the fish increase in growth. The eel may be taken as an example of our ignorance of fish life. Do professed naturalists know anything about it beyond its migratory habits ?—habits which, from sheer ignorance, have at one period or another been assumed as pertaining to all kinds of fish. The tendency to the romantic, specially exhibited in the amount of travelling power bestowed by the elder naturalists on this class of animals, would seem to be very difficult to put down. An old story about the eel was gravely revived a few years ago, having the larger portion of a little book devoted to its elucidation—a story seriously informing us that the silver eel is the product of a black beetle! But no one need wonder at a new story about the eel, far less at the revival of this old one; for the eel is a fish that has at all times experienced the greatest difficulty in obtaining recognition as being anything at all in the animal world, or as having respectable parentage of even the humblest kind. In fact, the study of the natural history of the eel has been hampered by old-world romances and quaint fancies about its birth, or, in its case, may I not say invention? "The eel is born of the mud," said one old author. "It grows out of hairs," said another. "It is the creation of the dews of evening," exclaimed a third. "Nonsense," emphatically uttered a fourth controversialist, "it is produced by means of electricity." "You are all wrong," asserted a fifth, "the eel is generated from turf;" and a sixth theorist, determined to outdo all others, and come nearer the mark than any of his predecessors, assured the public that young eels are grown from particles scraped off old ones ! The beetle theorist tells us that the silver eel is a neuter, having neither milt nor roe, and is therefore quite incapable of perpetuating its kind; that, in short, it is a romance of nature, being one of the productions of some wondrous lepidopterous animals seen by Mr. Cairncross (the author of the work alluded to) about the place where he lived in Forfarshire, its other production being of its own kind, a black beetle! The story of the rapid growth and transformatian of the salmon is—as will by and by be seen— wonderful enough in its way, but it is certainly far surpassed by the extraordinary silver eel, which is at one and the same time a fish and an insect. There can be no doubt that the eel is a curious animal even without the extra attributes bestowed upon it by this very original naturalist, for that fish is in many respects the opposite of the salmon: it is spawned in the sea, and almost immediately after coming to life proceeds to live in brackish or entirely fresh water. It is another of the curious features of fish life that about the period when eels are on their way to the sea, where they find a suitable spawning-ground, salmon are on their way from the sea to the river-heads to fulfil the grand instinct of their nature—namely, reproduction. The periodical migrations of the eel, on which has been founded the great fishing industry of Comacchio, on the Adriatic, can be observed in all parts of the globe: they take place, according to climate, at different periods from February to May; the fish frequenting such canals or rivers as have communication with the sea. The myriads of young eels which ascend are almost beyond belief; they are in numbers sufficient for the population of all the waters of the globe—that is, if there were reservoirs in which they might be preserved for food as required. The eel, indeed, is quite as prolific as the generality of sea fish. Eels have been noted to pass up a river from the sea at the extraordinary rate of eighteen hundred per minute! This montee used to be called eel-fair. It would be interesting, and profitable as well, to learn as much of any one of our sea-fish as we know of the salmon, and as considerable progress is now being made in observing the natural history of fish, we expect in time to know much more than we do at present; everything in the fish world is not taken for granted as formerly, although we are still inclined rather to revive old traditions than to study or search out new facts. Naturalists are so ignorant of how the work of growth is carried on in the fish world—in fact, it is so difficult to investigate points of natural history in the depths of the sea— that we cannot wonder at less being known about marine animals than about any other class of living things. The experiments carried on at the Brighton Aquarium may ultimately help us to more precise information. In that institution there is scope and verge enough for real practical work to be carried on. It is the want of precise information about the growth of fish that tells so heavily against our fisheries, for all is fish that comes to the fisherman’s net, no matter what size the animals may be, or whether they have been allowed to perpetuate their kind. No person, either naturalist or fisherman, knows how long a period elapses from the date of its birth till a turbot or cod-fish becomes reproductive. It is now well known, in consequence of repeated experiments, that salmon grow with immense rapidity, a consequence in some degree of quick digestive power. The cod-fish, again, reasoning from the analogy of its greatly slower power of digesting its food and from other corroborative circumstances, must be correspondingly slow in growth; but people must not, in consequence of this slower power of digestion, believe all they hear about the miscellaneous articles often said to be found in stomachs of cod-fish, as a large number of the curiosities found in the intestinal regions of his codship are placed there by fishermen, as a joke, or to increase the weight, and so enhance the price of the animal. As regards the natural history of one of our best-known food fishes, I have taken the pains to compile a brief precis of its life from the best account of it that is known. I allude to the mackerel; and from a perusal of the following facts it will be seen that our knowledge of the growth of this fish is very defective. 1. Mackerel, geographically speaking, are distributed over a wide expanse of water, embracing the whole of the European coasts, as well as the coasts of North America, and this fish may be caught as far southward as the Canary Islands. 2. The mackerel is a wandering unsteady fish, supposed to be migratory, but individuals are always found in the British seas. 3. This fish appears off the British coasts in quantity early in the year; that is, in January and February. 4. The male kind are supposed to be more numerous than the female. 5. The early appearance of this fish is not dependent on the weather. 6. The mackerel, like the herring, was at one time supposed to be a native of foreign seas. 7. This fish is laden with spawn in May, and it has been known to deposit its eggs upon our shores in the following month. Now, we have no account here of how long it is ere the spawn of the mackerel quickens into life, or at what age that fish becomes reproductive, although in these two points is unquestionably obtained the key-note to the natural history of all fishes, whether they be salmon or sprats. In fact we have no precise information whatever as to power of growth. We have at best only a few guesses and general deductions, and we would like to know as regards all fish—1st, When they spawn; 2d, How long it is ere the spawn quickens into life; and 3d, At what period fish are able to repeat the story of their birth. These points once known—and they are most essential to the proper understanding of the economy of our fisheries—the chief remaining questions connected with fishing industry would be of comparatively easy solution, and admit of our regulating the power of capture to the natural conditions of supply. As another example of long continued ignorance of fish life, I may instance that diminutive member of the herring family— the whitebait. This fish, which is so much better known gastronomically than it is scientifically, was thought at one time to be found only in the Thames, but it is much more generally diffused than is supposed. It is found for certain, and in great plenty, in three rivers—viz, the Thames, the Forth, and the Hamble. I have also seen it taken out of the Humber, not far from Hull, and have heard of its being caught near the mouth of the Deveron, on the Moray Firth; and likewise of its being found in plentiful quantities off the Isle of Wight. Mr. Stewart, the natural history draughtsman, tells me also that he has seen it taken in bushels on many parts of the Clyde, and that at certain seasons, while engaged in taking coal-fish, he has found them so stuffed with whitebait that by holding the large fish by the tail the little silvery whitebait have fallen out in handfuls. The whitebait has become celebrated from the mode in which it is cooked, and the excuse it affords to Londoners for an afternoon’s excursion, as also from its forming a famous dish at the annual fish-dinner of her Majesty’s ministers; but truth compels me to state that there is nothing in whitebait beyond its susceptibility of taking on flavour from the skilled cook. kept even for a few hours it becomes greatly deteriorated, and, in consequence, requires careful cooking to bring the flavour up to the proper pitch of gastronomic excellence. Perhaps, as all fish are chameleon-like in reflecting not only the colour of their abode, but what they feed on as well, the supposed fine flavour of whitebait, so far as not conferred upon that fish by the cook, may arise from matters held in solution in the Thames water, and so the result from the corrupt source of supply may be a quicker than ordinary decay. The waters of the Forth at the whitebait ground, a little way above Inchgarvie, of which I have given a slight sketch, where the sprat-fishing is usually carried on, are clean and clear, and the fish taken there are in consequence slightly different in colour, and greatly so in taste, from those obtained in the Thames; in fact. all kinds of fish, including salmon, live and thrive in the Firth of Forth. It is long since the refined salmon forsook the Thames but then salmon are very delicate in their eating, and at once take on the surrounding flavour, whatever that may be. Returning, however, to our whitebait, we have over and over again been assured by various authorities that that fish is the young of the shad; and a whole regiment of the young fish was shown by Mr. Larkin, a Cheapside fishmonger, in order to prove the case. All sizes were marshalled in order, from the tiniest specimen to the comparatively monster parent of the progeny—the great shad itself. The verdict must, however, in the meantime be the Scotch one of “not proven.” It is not very well known who first promulgated the theory of whitebait being the young of the shad; but Donovan, the author of a History of British Fishes, is at least responsible for spreading the error. What must, however, surprise all who take the trouble to study the controversy is this fact, that if whitebait be young shad, their parents are very seldom seen. There is no shad-fishery in the Thames, or near the Thames, at present; yet millions of these so-called young shad are annually devoured by visitors to Greenwich, Blackwall, and Richmond, not to speak of the number eaten in the great metropolis. If the progeny, then, are plentiful, how come the parents to be scarce? is the idea immediately presenting itself to the mind when requested to believe whitebait to be young shad. Fishes of all kinds, and especially the herring kind, are very prolific; but even if the female shad yields its ova in thousands, the dangers the young ones encounter considerably diminish the number that come to life. Thousands of pairs of shads would therefore be required to produce the quantities of so-called whitebait which are annually brought to table during the summer season. Shad were at one time very abundant in the Thames; and this fact would no doubt be a good argument in the mouths of those who were of opinion that whitebait grew in time into that fish. If, however, we reject the shad as the parent of the whitebait, and conclude that fish to be a distinct species, we shall undoubtedly want to know a great deal more about it than that bare fact. First of all, we must know where the parent fish can be found; secondly, if they be good for food; and thirdly, at what season and in what markets they are sold: it seems so strange that we should be addicted to eating the fry of a fish we never see! Besides, may we not reasonably enough conclude that if the fry be so very fine, the full-grown fish will be even more palatable? It is curious that while there are thousands of whitebait in the Firth of Forth, and equally curious that they are caught chiefly on the sprat-ground there, no Edinburgh fishmonger, nor any of the Scottish fishermen, ever saw specimens of these fish with milt or roe in them. Nor did any of these persons ever see a whitebait bigger than the usual size, that is, ranging in length from one to about three inches. After they attain that size they become either sprats or herrings. If what some naturalists have published in regard to its habits be true, the shad must be a very interesting fish. It has been hinted that it ascends from the sea to deposit its spawn in the rivers, being something like the salmon in that respect. In this phase of its life it is the opposite of the eel, which lives in fresh but spawns in salt water. What salmon do, shad can doubtless also accomplish, although it will go a long way to disprove what has been said by naturalists, if the shad should be proved not to be the parent of the whitebait, or rather, if it can be proved that whitebait are the young of some other fish. In the days when the herring was thought to be an animal migratory habits, rushing continually from our own firths and bays to the icy polar seas, some of the giants of the tribe were poetically described as swimming in the van of the mighty heer, acting as the guides and leaders of the smaller fish. These giants were Thwaite shads; but as it is now well known that the herring is local in its habits, and not migratory in the sense of taking long journeys, the shad must therefore be deposed from that leadership; nor can it be, even allowed the merit of being a tolerable table-fish, it is a coarse, insipid fish, and altogether destitute of the delightful flavour of the common herring. What is whitebait if it be not the young of the shad? Is it, then, a distinct species? It would be easy enough to befool the public with an absurd answer as to what whitebait is, because no writer, not the ubiquitous Buckland himself, can successfully contradict another on almost any point of fish-growth. When we see the transformation of the tadpole into a frog, and the zoea into a crab, we need not be surprised at its having been once prophesied that the whitebait turned a bleak, or the assertion that it undoubtedly grows into a herring (clupea hargenus) and if pressed for our reasons, we have a better answer to give than the young Scotch ploughman, who, being asked how he knew that God had made him, replied, after some little deliberation, that, “it was the common talk of the country.” In many places where whitebait are captured, fishermen believe them to be young herring—”herrinsile” they are called on the river Clyde; and this idea has been ventilated by the author in the popular periodicals of the day—it is an idea too that has long been common among our fishmongers. That whitebait are young herring, or sprats in an infantile stage, can be easily proved—on paper at least; and if our Government had a fish laboratory, such as the French have at Concarneau, the fact might very speedily be ocularly demonstrated. It is left, we suppose, for either the Brighton or Crystal Palace Aquarium to determine what fish the whitebait ultimately becomes, herring or sprat. There has been a great amount of controversy as to the natural history of the herring during late years, and so many curious facts have been educed, that no one need be surprised to learn that whitebait are truly the young of that fish. This may seem extraordinary; but without being dogmatic, it may be permitted us to say that the points of resemblance between herring and whitebait are wonderfully numerous and convincing, as well in the outward appearance as the anatomical structure of the two fishes. At all events the young of the shad and the true whitebait (at some places, such is the demand, that all sorts of fry are “manufactured” into the latter fish, there being so many who do not know one from the other) are very different in many essential points as in the formula of the fin-rays and the number of the vertebrae. Of course a young animal will change greatly in appearance during growth. The whitebait, for instance, in common with the sprat, has a serrated belly; but if it be the young of the herring, it must grow out of that serration. It is elsewhere argued that, in the case of the sprat, the bones protruding from the abdomen are ultimately covered by the growth of the animal, and so gradually disappear. Assuming “whitebait” to be young herring, we are entitled to ask at what date the fish of that name, sold in London in June and July, were spawned. The herrings at Wick, for example, are taken full of spawn up till the end of the great fishery in August; at what time, then, if whitebait be young herring, would those we can now eat at Blackwall be spawned? This, of course, involves a surmise as to the rate of growth of the herring itself, upon which question there has from first to last been much speculation, many very dissimilar ideas having been propounded as to the period at which the "poor man's fish" arrives at the reproductive stage. As we know that there are different races of herrings coming to maturity at different times, there ought to be no difficulty on this point, as the waters must constantly contain fish of all ages, and it appears certain that the whitebait of May and June cannot be older than the year ; it seems pretty certain, also, that the sprat-sized herrings which begin to come to market early in November are a little over a year old ; they were probably released from their tiny shells early in the August or late in the July of the previous year. It, is admitted by at least one competent naturalist, that fry of the sprat may be seen in multitudes in July and August, when they are of the length of two inches. We know, also, that young herrings and young sprats are captured indiscriminately in the Firth of Forth in the same shoals, of the same size, and presumably of the same age. In a shoal of young herrings the sizes of the fish are exceedingly varied, ranging from three to six inches in length, and of corresponding girth ; some serrated, some not ; some weighing a quarter of an ounce, some nearly an ounce. Were these fish all born at once ? How about the serrations ? Again, a jar of whitebait from the Thames, received by the writer for examination, contained specimens of all sizes ; some little more than an inch long, while some were two or three inches. How old would these be ? and were some of them serrated and others not ? The bellies being all decayed, that point could not be determined in any of the specimens received. February and March are the great months for the spring races of herring to spawn ; so that the specimens of whitebait just alluded to (there were other fishes besides the young of the herring and the sprat) would be about three months old ; and by November they would in all probability be grown to the average size of sprats. Young herrings of the Moray Firth, spawned in August, can sometimes be seen inshore about November, looking exactly like whitebait. The blanquette of Normandy and Brittany did not look when examined-if it was it that was placed before us-to be any other fish than our sprat in an early stage of its life. It is curious that whitebait exhibit many of the characteristics of the sprat, and particularly the strongly serrated abdomen. That peculiar mark is held by some naturalists as good proof that sprats never become herrings of any kind; if so, the same argument must likewise hold good against the whitebait being the young of the herring ; yet it is remarkable that the number of vertebra of both fishes, i.e. the common herring and a portion of the whitebait, are the same, namely, fifty-six, as are also the formula of the various fin-rays. But little weight need be laid on this latter point; few writers give the same figures about the fin-rays ; and as there are different kinds of herrings, and different races of each kind, it is probable that there will be differences in the number of fin-rays. What is harder to understand is the fact that the vertebrae differ also ; these urn from forty-seven in the sprat to fifty-six in the common herring, different numbers having been found in the same race of herring. But whilst it maybe admitted, for the sake of argument, that the smaller number might increase-i.e. that sprats with forty-eight vertebra, might grow into herring with fifty-six vertebra-it is quite clear that whitebait with fifty-six vertebrae will never grow into sprats with forty-eight vertebrae ! The more the case of the whitebait is studied, the more difficult it becomes to arrive at a satisfactory conclusion. The earliest writer on whitebait that we know is Pennant ; but when he wrote the whitebait was not a fashionable fish. It was eaten then only by "common people" "the lower order of epicures" - and the authorities, thinking that whitebait were the young or fry of some large fish, "proclaimed" that it should not be taken. Pennant at one time held the whitebait to be the young of the bleak, and Dr. Shaw followed suit in his General Zoology; while Donovan held "that same" to be the young of the shad. Donovan, blundering himself, "pitches into" Pennant for his errors, maintaining that the industrious zoologist had never seen the real whitebait. This latter idea is worth following up. Might not our savans, now that the mysterious dish has taken its place on the rich man's table, summon a congress to sit upon it? 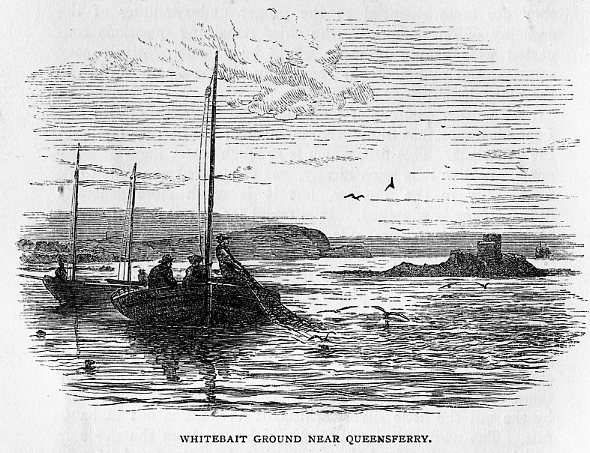 Were a general fishery congress to be held, it would be well that specimens of the whitebait of different rivers should be exhibited and reported upon; for the fish known as whitebait at Blackwall may not be the fish known as whitebait at Queensferry. In the case of the parr controversy, it was found that there were parrs of many different members of the salmon family, which, as a matter of course, greatly enhanced the difficulty of solution, as well as setting the experimenters by the ears. The whitebait mystery is one of those mysteries which many a dabbler in natural history will hold himself able to solve; and yet those attempting to solve the problem may be all working on different fishes. Any man who may know even a little about fish, will have seen that the so-called dish of whitebait, served at a fashionable tavern, is a varied mass of minnows, young bleak, infantile sprats, and the fry of other well-known fish. So much for this tavern celebrity ! Besides whitebait there are other mysterious fish-especially in Scotland-which are well worthy of being alluded to. 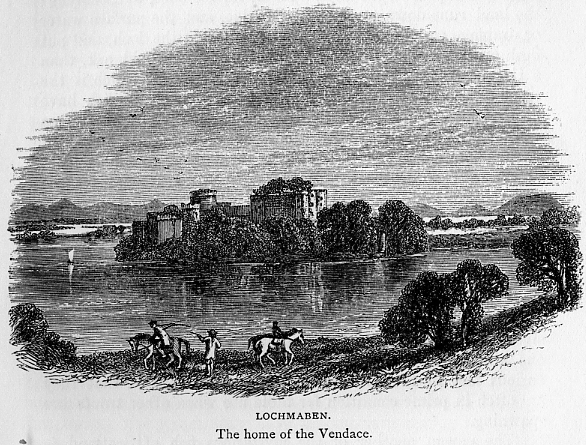 An idea prevails in Scotland that the vendace of Lochmaben and, the powan of Lochlomond are really herrings forced into fresh water, and slightly altered by the circumstances of a new dwelling-place, change of food, and other causes. One learned person lately ascribed the presence of sea fish in fresh water to a great wave which had at one time passed over the country. But no doubt the real cause is that these peculiar fish were brought to those lakes ages ago by monks or other persons who were adepts in piscicultural art. winter, and for this purpose gather, like the herring, into shoals They are very productive, and the young do not take long to grow to maturity. The specialties of the Lochleven trout may be chiefly ascribed to a peculiar feeding-ground, Feeding I believe to be everything, whether the subjects operated on be cattle, capons, or carps. The land-locked bays of Scotland afford richer flavoured fish than the wider expanses of water, where the finny tribe, it may be, are much more numerous, but have not the same quantity or variety of food, and, as a consequence, the fish obtained in such places are comparatively poor both in size and flavour. Nothing can be more certain than that a given expanse of water will feed only a certain number of fish ; if there be more than the feeding-ground will support they will be small in size, and if the fish again be very large it may be taken for granted that the water could easily support a few more. It is well known, for instance, that the superiority of the herrings caught in the inland sea-lochs of Scotland is owing to the fish finding there a better feeding-ground than in the large and exposed open bays. Look, for instance, at Lochfyne : the land runs down to the water's edge, and the surface water or drainage carries with it rich food to fatten the loch, and put flesh on the herring; and what fish is finer, I would ask, than a Lochfyne herring? Again, in the bay of Wick, which is the scene of the largest herring fishery in the world, the fish have no land food, being shut out from such a luxury by a vast sea wall of everlasting rock; and the consequence is, that the Wick herrings are not so rich in flavour as those taken in the sea-lochs of the west of Scotland. In the same way I account for the fine flavour and beautiful colour of the trout of Lochleven. This fish has been acclimatised with more or less success in other waters, but when transplanted it deteriorates in flavour, and gradually loses its beautiful colour-another proof that much depends on the feeding-ground ; indeed, the fact of the trout having deteriorated in quality as a consequence of the abridgment of their feeding-range, is on this point quite conclusive. I feel certain, however, that there must be more than one kind of these Lochleven trouts ; there is, at any rate, one curious fact in their life worth noting, and that is, that they are often in prime condition for table use when other trouts are spawning. The powan, another of the mysterious fish of Scotland, is also considered to be a fresh-water herring, and thought to be confined exclusively to Lochlomond, where they are taken in great quantities. It is supposed by persons versed in the subject that it is possible to acclimatise sea fish in fresh water, and that the vendace and powan, changed by the circumstances in which they have been placed, are, or were, undoubtedly herrings. The fish in Lochlomond also gather into shoals, and on looking at a few of them one is irresistibly forced to the conclusion, that in size and shape they are remarkably like common herring. The powan of Lochlomond and the pollan of Loch Neagh are not the same fish, but both belong to the Coregoni : the powan is long and slender, while the pollan is an altogether stouter fish, although well shaped and beautifully proportioned. I could analyse the natural history of many other fish, but the result in all cases is nearly the same, and ends in a repeated expression that what we require as regards all fish is the date of their period of reproduction ; all other information, without this great fact, is comparatively unimportant. It is difficult, however, to obtain any reliable information on the natural history of fish either by way of inquiry or by means of experiments. Naturalists cannot live in the water, and those who live on it, and have opportunities for observation, have not the necessary ability to record, or at any rate to generalise what they see. No two fishermen, for instance, will agree on any one point regarding the animals of the deep. I have examined many intelligent fishermen during the last ten years, and few of them have any real knowledge regarding the habits of the fish which it is their business to capture. As an instance of fishermen's knowledge, one of that body recently repeated to me the old story of the migration of the herring, holding that the herring comes from Iceland to Great Britain in order to spawn, and that the sprat goes to the same icy region that it may fulfil the same instinct ! "Where are the haddocks?" I once asked a fisherman. "They are about all eaten up, sir," was his very innocent reply; and this in a sense is true. The shore races of that fish have long disappeared, and our fishermen have now to seek this most palatable inhabitant of the sea in deeper water. Vast numbers of the haddock used to be taken in the Firth of Forth, but during late years they have become very scarce, and the boats now require to go a night's voyage to seek for them. If we knew the minutiae of the life of this fish we should be better able to regulate the season for its capture, and the percentage that we might with safety take from the water without deteriorating the breeding power of the animal. There are some touches of romance even about the haddock, but I need not further allude to these in this division of my book, as I shall have to refer to this fish under the head of the "White Fish Fisheries." The haddock, like all fish, is wonderfully prolific, and is looked upon by fishermen as being also a migratory fish, as are also turbot and many other sea animals. The family to which the haddock belongs embraces many of our best food fish, as whiting, cod, ling, etc. ; but of the growth and habits of the members of this family we are as ignorant as we are of the natural history of the whitebait or sprat. I have the authority of a rather learned Buckie fisherman for stating that cod-fish do not grow at a greater rate than from eight to twelve ounces per annum. This fisherman had seen a cod that had got enclosed by some accident in a large rock pool, and so had obtained for a few weeks the advantage of studying its powers of digestion, which he found to be particularly slow, although there was abundant food. The haddock, which is a far more active fish, my informant considered grew more rapidly. On asking this mail about the food of fishes, he said he was of opinion that they preyed extensively upon each other, but that, so far as his opportunities of observation went, they did not as a matter of course live upon each other's spawn ; in other words, he did not think that the enormous quantities of roe and milt given to fish were provided, as has been asserted by one or two writers on the subject, for any other purpose than keeping up the species. The spawn of sea-animals is extensively wasted by other means ; and fish have no doubt a thousand ways of obtaining food that are unknown to man ; indeed the very element in which they live is a great mass of living matter, and doubtless affords by means of minute animals a wonderful supply of food. Fish, too, are less dainty in their eating than is generally supposed, and some kinds eat the most revolting garbage with great avidity. It is a very common error that all fish are migratory. Some fishermen, and naturalists as well, picture the haddock and the herring as being afflicted with perpetual motion-perpetual wanderers from sea to sea and shore to shore. The migratory instinct in fish, in my opinion, being very limited. They do move about a little, without doubt, but not farther than from their feeding-ground to their spawning-ground-from deep to shallow water. Some plan of taking fish other than the present must speedily be devised ; for now we only capture them-and I take the herring as an example-over their spawning-ground, when they are in the worst possible condition, their whole flesh-forming or fattening power having been bestowed on the formation of the milt and roe. I repudiate altogether this iteration of the periodical wandering instincts of the finny tribes. There are great fish colonies in the sea, in the same way as there are great seats of population on land, and these colonies are stationary, having, comparatively speaking, only a limited range of water in which to live and die. Adventurous individuals of the fish world occasionally roam far away from home, and speedily find themselves in a warmer or colder climate, as the case may be ; but, speaking generally, as the salmon returns to its own waters, so do sea fish keep to their own colony. All they seem to need is a rallying point-thus at any place where there is a wrecked ship in the water, a sand-bank, or a chain of rocks, certain kinds of fish will there be found assembled. Our larger shoals of fish, which form money-yielding industries, are of wonderful extent, and must have been gathering and increasing for ages, having a population multiplied almost beyond belief. Century after century must have passed away as these colonies grew in size, and were subjected to all kinds of influences, evil or good : at times decimated by enemies, or perhaps attacked by mysterious diseases, that killed the fish in tens of thousands. Schools or shoals of fish, when they become of an extent that will admit of constant fishing, must have been forming during long periods of time ; for we know that, despite the wonderful fecundity of all kinds of sea-fish, the expenditure of both seed and life is something tremendous. We may rest assured that, if a female codfish yields its roe by millions, a balancing power exists in the water that prevents the bulk of the eggs from coming to life, or at any rate from reaching maturity. If it were not so, how came it, when there was no fish commerce, and when man only killed the denizens of the sea for the supply of his individual wants, that our waters were not, so to speak, impassable from a superfluity of fish ? Buffon has said that if a pair of herrings were left to breed and multiply undisturbed for a period of twenty years, the result would be a bulk of fish equal to that ' of the globe on which we live !